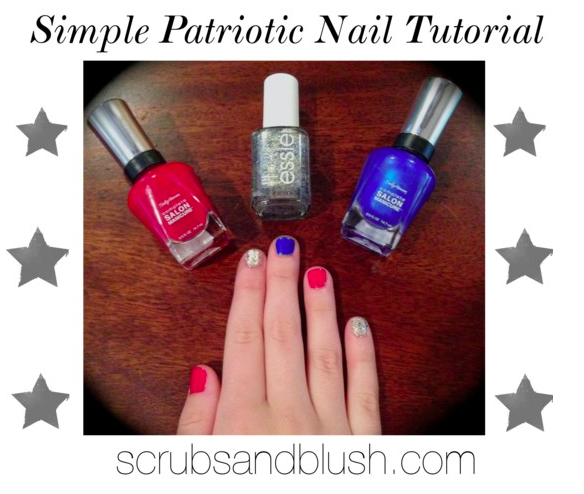 So I know I'm a day late to call this "Manicure Monday" but I really wanted to share this tutorial because I've been seeing a lot of July 4th nail ideas on Pinterest, Instagram, and other social media apps. However, although the ideas I've seen have been cute, I haven't seen any easy or simple ideas that everyone can do. Because lets be honest, not everyone has a nail art kit. I was very impressed by all three of these polishes. The Sally Hansen Complete Manicure Polishes truly looked like salon quality manicure. I love these polishes because it gives you a lot of color pay off and leaves the nails super shiny without the salon trip. I also loved this color in Essie because it was so buildable and didn't clump up like a lot of glitter/sequin polishes I've tried. 1) Paint the thumb and ring finger with two coats Sally Hansen's Complete Salon Manicure in Red My Lips. 2) Apply three coats of the pointer and pinkie finger with Essie's On a Silver Platter. 3) Paint the middle finger with two coats of Sally Hansen's Complete Salon Manicure in Blue My Mind. *Quick Tip: Allow a couple of minutes of drying time in between coats. Hope everyone has a fun and safe Independence Day! Don't forget to read my next post, "Tip Tuesday: Skin Edition".